Rima Staines is an artist using paint, wood, word, music, animation, clock-making, puppetry and story to attempt to build a gate through the hedge that grows along the boundary between this world and that. Her gate-building has been a lifelong pursuit, and she hopes to have perhaps propped aside even one spiked loop of bramble (leaving a chink just big enough for a mud-kneeling, trusting eye to glimpse the beauty there beyond), before she goes through herself. Rima was born in London in 1979 to a family of artists and has always been stubborn about living the things that make her heart sing. With her partner Tom Hirons (a writer, storyteller, acupuncturist, poet & wilderness rites of passage guide), and their young son, they live in the Hedgespoken truck, taking old stories along the byways of the land. Rima’s artwork has appeared in and on books, magazines, and record covers on both sides of the Atlantic. She maintains a passionately-followed blog at intothehermitage.blogspot.com and has sold paintings and prints of her work (as well as the clocks she makes) in her travels the length and breadth of Britain. Her work hangs on walls in six of the seven continents. 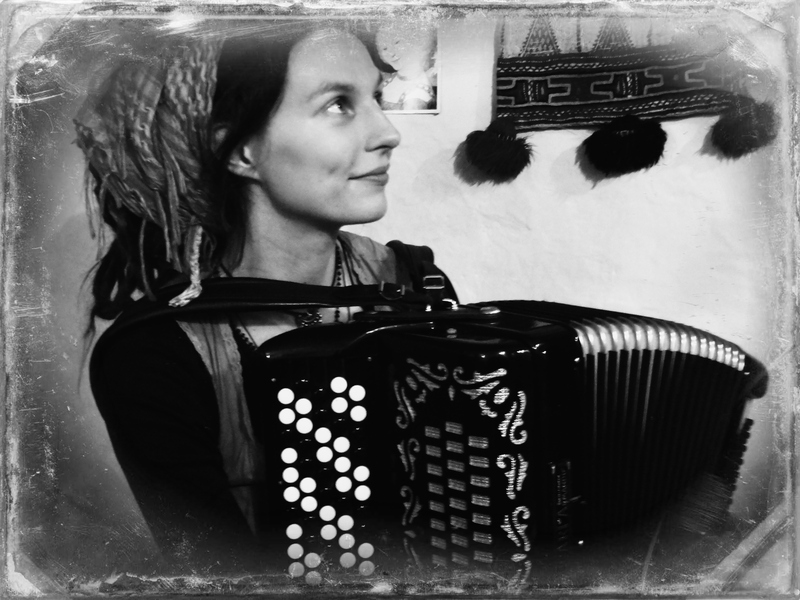 A former accordionista with the London Gypsy Orchestra, she can now be found playing by Devon’s street corners and campfires, and giving life to puppets on the edges of woods. She has books in the making, and also produces animations and puppets and obscure games in lost dialects. Rima’s inspirations include the world and language of folktale; the faces of the people who pass her on the street; the folk music and art of Old Europe and beyond; peasant and nomadic living; magics of every feather; wilderness and plant-lore; the margins of thought, experience, community and spirituality; and the beauty there is to be found in otherness. 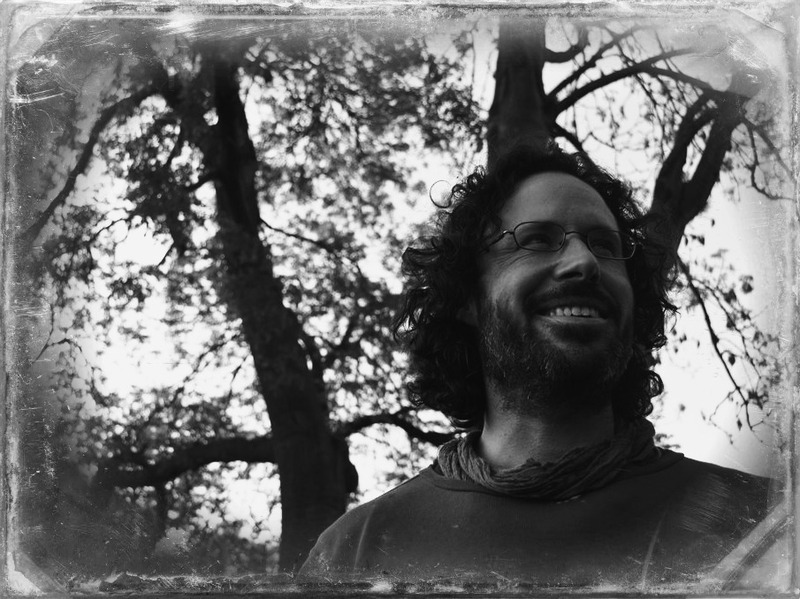 Fifteen years as a leatherworker and part-time storyteller in Scotland now sees Tom nestled in a green corner of Dartmoor, gathering word-bundles in the woods for his peculiar spells of allegory, metaphor and image. Amongst the trees and the rock-strewn hills, he sometimes finds the rhythm beneath the rhythm and the story beneath the story. He also makes hand-made leather carnival masks, as Smickelgrim. His written work appeared in the final edition of the Journal of Mythic Arts, alongside that of Rima, and has also recently appeared in STIR magazine. He is a founder-member of Source Point Community Acupuncture, a worker co-op community acupuncture clinic in Moretonhampstead, Devon, where he works to provide affordable acupuncture to the Dartmoor community. Hello, we were given this link by one of our forum posters, love the traveling wagon! Very pleased to meet you briefly this morning at Deer Leap 😊 Loved your wagon and hope to see you somewhere along the way. I gave your card to Dean Collier and hope he gets in touch with you. Rima and Tom: I love your experimental life!! !